Filmmaking and video production is a process that involves many skills and many roles. This audio-visual medium combines several art forms into one. It can even be said that parts of film and video production grew from these other fields – screenwriting grew from playwriting, set design grew from visual arts and design in general, cinematography grew from photography, soundtrack production grew from professional music. But there is only one side of filmmaking and video production that is unique and specific to this field only – video editing. 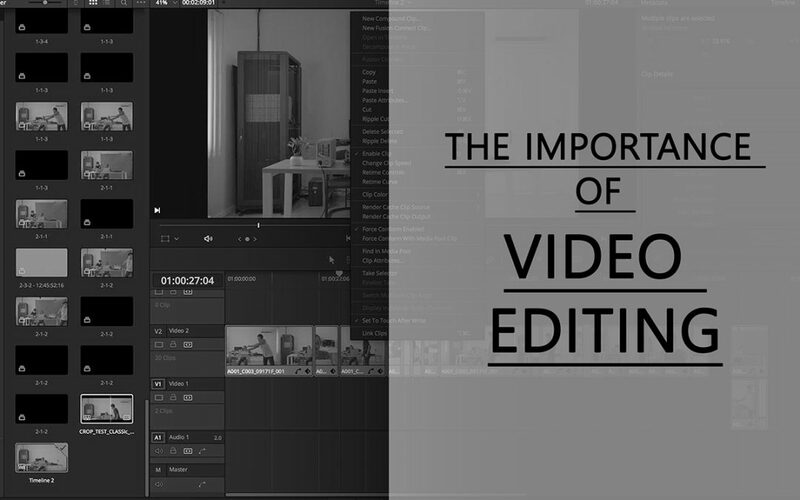 And in this blog post we will explain the importance of video editing. If we look at video editor’s role from a very technical point of view we can say that it entails to work with all the material (footage, sound, effects etc) and assemble this material into a coherent sequence which tells a certain story. In some way video editor is similar to literary editor – they choose the good parts and cut out the bad shots and shuffle all material around to make the best final work possible. But it is not as simple as that. The aim of video editing is to create a story out of all footage, and to tell this story in a way that affects viewers and makes them feel and think in a certain way. This dramatic effect on audience is where the skilful part of video editing comes into play. The time spent in shooting is usually very small comparing to the time spend in post-production, and most of this time directors work in close collaboration with video editor. The execution of director’s vision in many ways is in hands of video editor. For this collaboration to really work, the video editor must be not only very skilful and experienced technically, but also artistically talented and creative. They also must be very knowledgeable about video and film production process in general and be able to see the bigger picture while simultaneously working on the details at hand. In fact, video editing is such an important part of film and video production that many directors have chosen to do video editing themselves. The most basic and fundamental task of video editor is to assemble all footage and other material in a way which creates a desired story or narrative. For a story to flow well it is important to make sure there is consistency of all elements across scenes and across all project. This consistency is also called continuity. A matter related to continuity is for example having the same outfits in same scenes. Most of the continuity matters are controlled on set while shooting the material. In bigger projects this is usually controlled by script supervisor. But some continuity mistakes can be controlled and fixed in post-production as well via digital touch-ups done by video editor or other post-production technicians. While creating the story/narrative and maintaining continuity are the core tasks of video editors, the part of the job which brings this skill to the level of art is the ability of video editor to create material which manipulates audiences in a certain way or in other words creates certain psychological and dramatic effect on the viewers. That is why video editing is also sometimes called the second phase of directing. This is the time when decisions are made regarding which shots are best, which should be cut out, what combinations of shots would create needed psychological effect and what pacing to use for certain scenes. All this crucial work video editor does together with the director who is the one leading the whole project and deciding how the story will unfold as well as what artistic devices will be used to create certain dramatic effects. Usually a very close and effective relationship between editor and director is a must to really create a good final material. Important aspect of this relationship is the fact that editors don’t spend much time on film set so they are less attached to certain scenes and can easier make decisions to keep certain material or leave it out. Directors in this respect can be less objective as they often can spend a lot of time (and money) directing and shooting a scene and therefore can become attached to it even though it might not be suitable when seen in the context of the whole story. While working on combining footage in certain way, video editor uses special techniques. The main aim behind any choice of technique is to understand whether this technique will move the story forward in the desired way. Editors can use multiple kinds of transitions – fade-in, fade-out, dissolve and other. Another technique is to emphasize an emotion through specific pacing of the video – editor can slow the pacing down for pensive effect, create tension by cutting footage more quickly etc. Selecting and adding certain kind of music to certain scenes is another crucial technique to manipulate emotions of viewers in a certain way. Generally, it can be said that the main technique of video editing is to see how each part relates to the whole story and what kind of combinations or juxtapositions of shots will drive the story in the desired direction or create needed metaphors or subtexts. It is often said that video editing has been done successfully only then when viewer cannot notice it has been done. This is probably a bit of an exaggeration as one will always see the editing if they really pay attention to it. But generally, a good edit will really draw attention to the story and thus viewer will not even notice that editor is cutting footage in a particular way. And conversely – an unprofessional and rough editing will become very visible and distract viewers. Jumping from one shot to another without enough logical reason behind it can distract viewers. Pacing that is too quick can make it hard to understand what is happening on screen. Pacing that is too slow can make audiences bored. Wrong cuts in wrong places can make plot unintelligible and emotions un-perceivable. A video or film that has been edited in a professional and creative way is like a good book. The writing, the page, the paper (or the screen) disappear. Audiences are consumed by the journey on screen and follow the characters and the story.